Don’t you wish you could just wave a magic wand that would – alacazam! – make your students less distracted & more focused? Well it’s not quite magic, but I’ve got a tip for you that should do just that. Have them clear their desks. Here’s what I mean…..Your students should only have on their desks what they are currently working on right now. Taking notes? They just need their notebook and a pen. Working on a group project? They certainly don’t need that stack of books from their other 5 classes. Simple require students to put everything (and I mean everything) they don’t need on the floor. It’s amazing how many distractions you will cut out when there’s not a stack of books on the desk for them to hide stuff behind. You name it – cell phones, other classes’ homework, notes, food, all of that stuff is way harder to hide when all they have on their desk is one notebook and a pen. It’s amazing how many distractions you will cut out when there’s not a stack of books for students to hide behind. And, even better, it’s less distracting for them. I don’t know about you, but when I’ve got a whole bunch of things strewn all over my desk, those things tend to pull my attention. So, starting tomorrow, you’ve got a new policy. Everything that they don’t need goes under the desk. You’ll have to remind them. And remind them. And remind them. (And remind them some more). But it will be worth it – and eventually they’ll even get used to it. Have you tried this technique in your classroom? 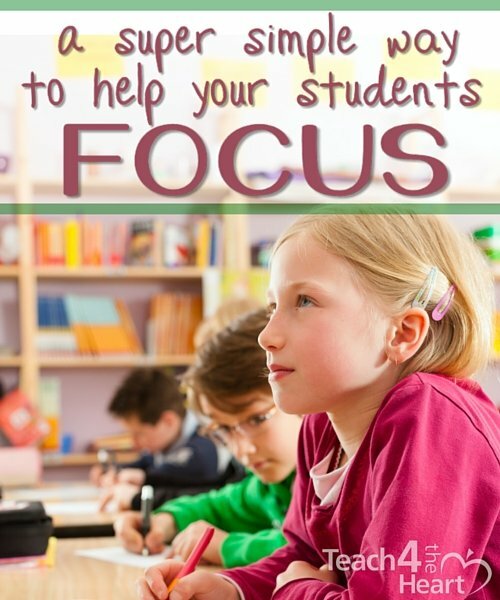 What else do you do to help your students focus? I totally agree, but in 2 out of 3 schools I’ve worked in there wasa school-wie policy of not putting anything on the floor, because of it being a fire hazard. What do you suggest for those cases? These were middle schools so most of the time the desks could not have things placed inside them. I sometimes had my middle school students put their extra items on the shelf that was under their chair. They HATED it, but it made a difference when I did it. I’m an elementary English teacher and have been using this technique for the past two years. It’s wonderful! It is true that you have to keep reminding them, especially those students with attention problems. When I get to the classroom and greet them, the first thing I say is “Put everything away.” “Take out your notebook, take out your pencil. ” and so on, depending on what we will be using for that moment. This post is truly an answer to my prayers. I was just telling my husband a few hours ago that I’m all out of ideas and ready to give up on having some of my classes being well-managed. Also, I told my induction coach earlier today, “I just want to be awesome at this! Please tell me how to turn things around and be awesome at this!” This is so simple, yet it would have prevented many of the problems I had today that eventually had me exasperated. I’ll be implementing this tomorrow! I doubt my middle schoolers will love it, but it’s certainly doable. Thank you! That is a great idea! “A cluttered desk is a sign of a cluttered mind.” One technique I use is to have students have nothing in their hands while I’m speaking. Also, I have them “freeze” while giving end-of-class instructions so they’re not distracted by putting away their stuff. These really help.